A detailed literature search using PubMed revealed that only seven cases of endogenous endophthalmitis from H. capsulatum are reported in the literature.,,,,,, Here we present a rare case of a 47-year-old patient, post immunosuppressive therapy for Granulomatosis with polyangiitis (Wegener's granulomatosis), with maculopapulonodular lesion over the face, neck and the trunk with ocular involvement. A 47-year-old male, resident of Assam, known diabetic and hypertensive, presented to us in October 2014 with the chief complaint of diminution of vision in both eyes (OU) for 4 months. On careful history taking, it was found that he first consulted a physician 6 months back in May 2014 for the complaints of fever, weight loss, and worsening of diabetes and was started on empirical antitubercular therapy (ATT) for cavitary lesions in lungs seen on chest X-ray for 6 months. Three weeks later, he developed an oral ulcer and gastrointestinal symptoms. On the basis of skin biopsy, a probable diagnosis of sarcoidosis was made and so he was started on steroids and methotrexate along with ATT. One month later, in June 2014, the patient then consulted elsewhere and considering the possibility of GPA (Wegener's granulomatosis), he was advised antineutrophil cytoplasmic antibody test and anti-proteinase 3 test. Both the tests came out to be positive and the diagnosis of GPA was confirmed and he was continued on immunosuppressive therapy; this time, he was treated with intravenous cyclophosphamide and methylprednisolone followed by oral prednisolone till October 2014. 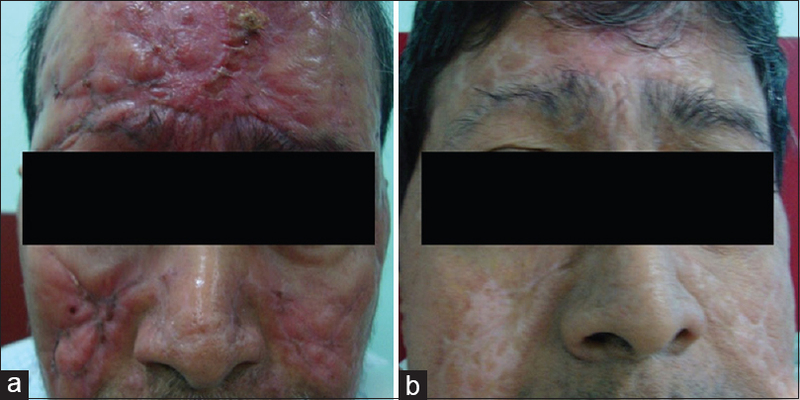 During tapering of the steroids in October 2014, he developed fever; lesions in the oral cavity; maculopapulo-nodular lesions over the face, neck, and trunk; and worsening of diabetes [Figure 1]a. Biopsy of these skin lesions done elsewhere confirmed the presence of H. capsulatum and was treated with intravenous liposomal amphotericin B (200 mg once daily for 30 days) followed by oral itraconazole (400 mg twice daily for 1 year). After taking antifungal treatment, the patient's symptoms improved, but he developed decreased vision in OU which on evaluation elsewhere showed bilateral uveitis and was prescribed topical steroids and cycloplegics and referred to a tertiary eye care center elsewhere where he was administered one dose of intravitreal injection in OU (ceftazidime 2.25 mg and voriconazole 100 μg each in 0.1 ml). He came to us for further management. On examination, his visual acuity in OU was perception of light positive with accurate projection of rays in all the four quadrants. Slit-lamp examination showed fibrinous exudates, 360° posterior synechiae, complicated cataract, and small nodules all over the iris surface in OU [Figure 2]a. Intraocular pressure (IOP) was found to be 4 mmHg and 3 mmHg in the right eye (OD) and left eye (OS), respectively. Ultrasonography B-scan of the OU revealed low-reflective membrane echoes in vitreous cavity and increased retinochoroidal thickness [Figure 3]. The patient was systemically stable with blood sugar levels within normal limits. Figure 3: (a) Ultrasonography B-scan of the right eye showing low-reflective intragel membranous echoes in the vitreous cavity with retinochoroidal thickness of 2.1 mm. (b) Ultrasonography B-scan of the left eye showing low-reflective intragel membranous echoes in the vitreous cavity with retinochoroidal thickness of 3 mm. The patient was diagnosed to have bilateral endogenous endophthalmitis. Considering the deteriorating ocular condition of the patient and need for prompt treatment, a provisional diagnosis of H. capsulatum endophthalmitis, based on the skin biopsy report in an immunosuppressed state, was made. Accordingly, the patient was posted for intravitreal injection of voriconazole and ceftazidime and later to plan for lensectomy + vitrectomy in OU. Accordingly, the patient was given intravitreal injections in OU (ceftazidime 2.25 mg and voriconazole 100 μg each in 0.1 ml) in October 2014. An aqueous sample was simultaneously collected, but the sample was found to be inadequate for microbiological examination. 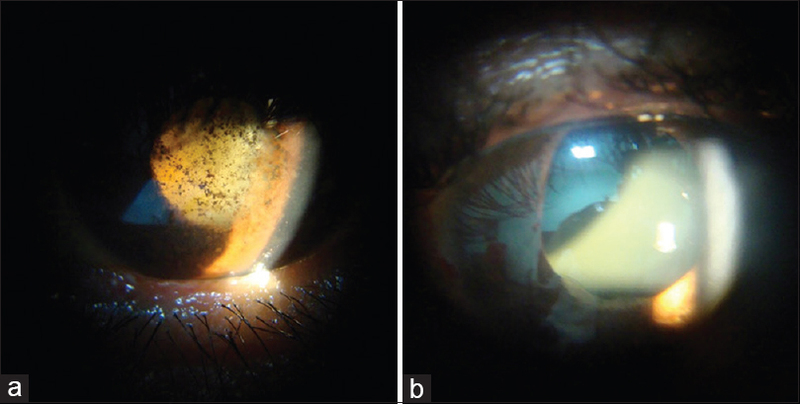 A rapidly deteriorating ocular condition of the patient disallowed further resampling. Thus, to salvage the eyes and to prevent further delay in treatment, a provisional diagnosis of Histoplasma endophthalmitis was made based on biopsy-proven systemic histoplasmosis. The patient then underwent lensectomy + vitrectomy + silicone oil implantation and intravitreal voriconazole without intraocular lens implantation in OU elsewhere. The patient was followed up monthly and the vision gradually improved to 6/18 OD and 6/60 OS with the resolution of facial lesions with minimal scarring in May 2015 [Figure 1]b. In June 2015, the patient's best-corrected visual acuity was 6/18 OD and 6/36 OS, with the resolution of exudates and endothelial deposits and the clearing of visual axis [Figure 2]b. Due to continued instillation of steroid, there was a rise in IOP to 34 mmHg OD and 24 mmHg OS, which was treated with antiglaucoma medication. In August 2015, emulsification of the silicone oil was noted in OU and the patient underwent silicone oil removal in OU. Subsequently, the patient developed hypotony and the vision decreased to 6/18 OD and counting fingers at 2 m OS with IOP of 6 mmHg OD and 7 mmHg OS. His vision was maintained till 1 year of follow-up. H. capsulatum is a dimorphic fungus since it grows in mycelial form at room temperature in the soil or in Sabouraud's agar and, at body temperature, it grows like yeast. It can be diagnosed microscopically and through serological testing. On microscopy, at room temperature, it grows as septate hyphae with round- or pear-shaped conidia and, at body temperature, it grows like yeast. Serological tests include complement fixation, immunodiffusion, and mycelial antigen identification. The severity of infection caused by H. capsulatum depends on the basis of the immune status of the patient. Our patient was a known diabetic and, in addition, was taking immunosuppressive drugs for a prolonged period of time. Drug-induced immunosuppression probably led to the opportunistic infection by H. capsulatum. To our knowledge, only seven cases of endogenous endophthalmitis by H. capsulatum have been reported in the literature.,,,,,, On the basis of immune status, of the seven cases reported, five were immunocompetent,,,,, one was an HIV positive, and, in one case, immunologic status was unknown. In one case, infection developed post cataract extraction. Of all the seven cases, six cases had poor visual outcome,,,, but one case showed improvement. Due to its slow rate of growth, the treatment of intraocular histoplasmosis is difficult. We treated our patient aggressively with multiple intravitreal injections of voriconazole and ceftazidime followed by pars plana vitrectomy with lensectomy. Although a rare entity, H. capsulatum should be considered as a possible etiology of endophthalmitis in an immunosuppressed host. Thus, in this case report, the authors want to emphasize that the systemic condition of the patient should be taken into account while formulating the provisional diagnosis. This case is of endogenous endophthalmitis since there is no history of trauma or any surgery, and the only systemic cause that could be pointed out is histoplasmosis secondary to immunosuppression. We would like to thank Sri Kanchi Sankara Health and Educational Foundation, Guwahati, Assam, India, for their support. Darling ST. The morphology of the parasite (Histoplasma capsulatum) and the lesions of histoplasmosis, a fatal disease of tropical America. J Exp Med 1909;11:515-31. Gonzales CA, Scott IU, Chaudhry NA, Luu KM, Miller D, Murray TG, et al. Endogenous endophthalmitis caused by Histoplasma capsulatum var. capsulatum: A case report and literature review. Ophthalmology 2000;107:725-9. Schlaegel TF Jr. Histoplasmic choroiditis. Ann Ophthalmol 1974;6:237-52. Scholz R, Green WR, Kutys R, Sutherland J, Richards RD. Histoplasma capsulatum in the eye. Ophthalmology 1984;91:1100-4. Macher A, Rodrigues MM, Kaplan W, Pistole MC, McKittrick A, Lawrinson WE, et al. Disseminated bilateral chorioretinitis due to Histoplasma capsulatum in a patient with the acquired immunodeficiency syndrome. Ophthalmology 1985;92:1159-64. Specht CS, Mitchell KT, Bauman AE, Gupta M. Ocular histoplasmosis with retinitis in a patient with acquired immune deficiency syndrome. Ophthalmology 1991;98:1356-9. Grancini A, Colosimo M, Mapelli C, Cogliati M, Pallotti F, Grande R, et al. A case of Histoplasma capsulatum endophthalmitis diagnosed in Italy. Travel Med Infect Dis 2013;11:256-8. Hoefnagels KL, Pijpers PM. Histoplasma capsulatum in a human eye. Am J Ophthalmol 1967;63:715-23. Leung C, Farmer JP, Zoutman DE, Urton TE, Gale JG. Histoplasma capsulatum endophthalmitis in Southeastern Ontario. Can J Ophthalmol 2010;45:90-1. Goldstein BG, Buettner H. Histoplasmic endophthalmitis. A clinicopathologic correlation. Arch Ophthalmol 1983;101:774-7. Carroll DM, Franklin RM. Vitreous biopsy in uveitis of unknown cause. Retina 1981;1:245-51. Schlaen A, Ingolotti M, Couto C, Jacob N, Pineda G, Saravia M, et al. Endogenous Histoplasma capsulatum endophthalmitis in an immunocompetent patient. Eur J Ophthalmol 2015;25:e53-5. Pulido JS, Folberg R, Carter KD, Coonan P. Histoplasma capsulatum endophthalmitis after cataract extraction. Ophthalmology 1990;97:217-20.